Extensive information on the Arctic Circle. 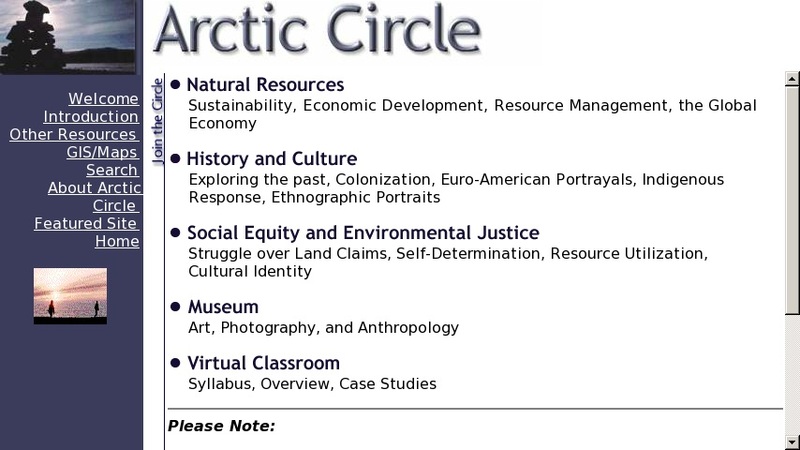 Highly acclaimed website features: natural resources, history and culture, society equity and environmental justice, a museum, a virtual classroom, and an Arctic forum, a discussion group for visitors. A wealth of information concerning the Arctic is at your fingertips. Site also includes information on Arctic legislation, natural resource management, stories about indigenous people, art and photo gallery, and GIS. Also features Arctic literature, music, and media.